Government has informed Lok Sabha that Non-Resident Indians (NRI) cannot file Right to Information (RTI) applications to seek governance-related information from Central government department. It mentioned that only citizens of India have the right to seek information under the provisions of RTI Act, 2005 and NRIs are not eligible to file RTI applications. This law was passed by Parliament on 15 June 2005 and came fully into force on 12 October 2005. It mandates timely response to citizen's requests for government information by various public authorities under Central Government as well as the State Governments. The law imposes penalty for wilful default by government officials. Citizens can ask for anything that government can disclose to Parliament. Objectives of RTI are to empower citizens (as right to information is the fundamental right of the citizens under Article 19), promote transparency and accountability in working of Government, check corruption and make our democracy work for the people in the real sense. Public authorities defined under this law are required to reply expeditiously or within thirty days of the request. The law also mandates every public authority to computerise their records for wide dissemination and proactively certain categories of information so that citizens need minimum recourse to request for information formally. Information that can prejudicially impact internal security, relations with foreign countries, intellectual property rights, breach of parliamentary privilege and impedes investigations cannot be shared with public under RTI. Cabinet papers are exempted from RTI until decision has been implemented. However, discussions within Cabinet are never disclosed under RTI. Q. 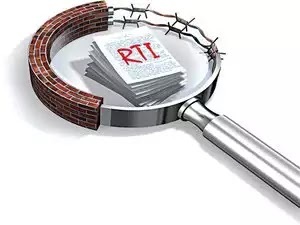 As per the latest information that Government has goven to Lok Sabha, who cannot file Right to Information (RTI) applications to seek governance-related information from Central government department?